Quizno's fast food sandwich shops around the country are operated by franchisees who pay Quizno's for the right to open one of their restaurants (and for the building and equipment, etc). In August of 2007 some of these franchisees filed a lawsuit against Quizno's over some of Quizno's business practices. Last week additional Quizno's franchisees joined the lawsuit and additional complaints were added. "The crux of the lawsuit focuses on what franchisees label as an illegal and deceptive business scheme, which they say has been played out since 2000 to induce unwitting prospects to purchase and operate Quiznos sandwich shops and pay franchise-related fees. They depict it as Quiznos' way to exploit its control and power "in order to extract exorbitant and unjustifiable payments from franchisees." In perpetrating their plan, Quiznos is accused of implementing slick sales tactics and marketing the "American dream of business ownership in the fastest growing franchise in the United States." The complaint states that Quiznos preyed on ordinary consumers with little experience in operating a business and little understanding the legal ramifications of its one-sided, non-negotiable franchise agreement." read the rest of the story at Blue Mau Mau. At long last, Quizno’s has revealed the nutritional information for their toasted subs, salads, soups and bread bowls. 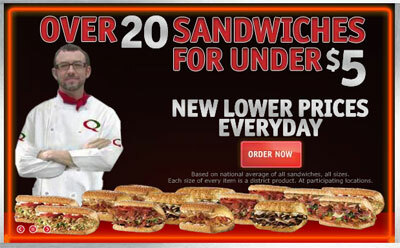 We wrote about Quizno’s lack of nutritional data back in March of 2006. Until this week they were the largest fast food restaurant chain that did not publish their nutrition data. To make it a bit simplier we’ve posted Quizno’s nutritional information all in one chart. 2 of the 5 salads Quizno's serves have 1,000 calories. The Roasted Chicken with Honey Mustard Flatbread Salad has 1120 calories and 76 grams of fat! Quizno's large Prime Rib Cheesesteak Sub has 1,770 calories and 116 grams of fat (that's 1030 calories from fat). It also has 2.5 grams trans fat. Quizno's Turkey Bacon Guacamole Sub with reduced fat Buttermilk Ranch dressing has a whopping 4530 mg of sodium! The US FDA recommends less than 2,400 mg of Sodium per day for adults. Quizno's has 31 items with over 2,400 mg of Sodium. Quizno's also has 34 items with over 50 grams of fat. Oh, and about the 'healthy' stuff... Quizno's large Veggie sub has 1,220 calories and 75 grams of fat! If you suspected that Quizno’s didn’t publish this data sooner because the calorie, fat and sodium counts were high, you were right. Note: Most fast food restaurant chains have a full nutritional data chart available; Quizno's only offers the data 1 sandwich at a time... it makes for lots of clicking. And the sauce and cheese data is only added to the totals after you do some more clicking. To find the data on Quizno’s website, go to Quizno’s menu page and then click on a food category (like Subs), then find “Show Nutrition Information” at the bottom. This will cause a link to “Nutritional Information” to appear under each food item. Click one of these links will open the nutritional information in a new window. Then you’ll have to check the boxes next to things like dressing and cheese to get the grand total for the item. I don't know exactly how long the Quizno's data has been available. I discovered it after a tip from a Fast Food News reader. You can bet Quizno's won't be promoting it. US Food Policy has also written about the new Quizno's data, too. You can also find Quizno's complete nutrition data here. It still boggles my mind that Quizno's can get away with not providing nutrition information about their sandwiches. Since Quizno's first appeared on the fast food sandwich horizon, I've pointed out this lack of data in blog posts about Quizno's, on my Fast Food Facts nutrition web site and in my book of the same name. Parke, over at US Food Policy, recently reiterated his comments on this omission, too. Here's why Quizno's wanting to keep their calories a secret doesn't make sense to me: A potential customer that counts calories (or other data) might eat a company's product after they check the nutrition data, but won't eat it if they discover the company won't reveal the data. Sure, most people don't care and don't check, but others do and those people aren't eating at Quizno's. Isn't that bad for business? And there are a lot of people who check nutrition info before they eat; a half million a month on my web site alone.